Engineering Services | CCE, Inc.
Our experienced engineers will work with you to custom design the right crane, hoist, and truss track system to meet your specific workload requirements. We will discuss with you the weight proportions, space allocations, usage requirements, lift and hoist speeds, environmental applications, and any other design specifications unique to your business. 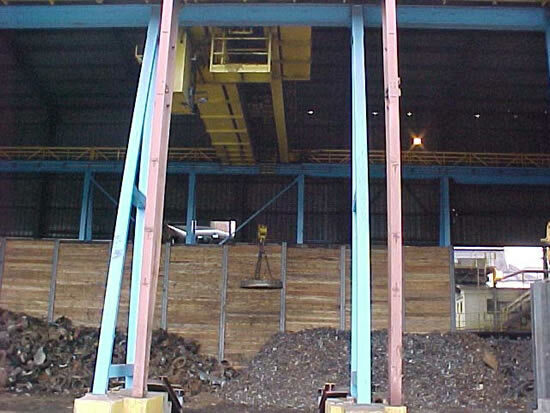 This photograph shows support columns and an overhead bridge crane system designed and built by CCE, Inc. for the receiving bay of a scrap metal processing plant. To view a variety of industrial designs and implementations please visit our Crane & Hoist Industry Solutions page.